Mastermind is a classic game of strategy. I’ve played it many times, it was one of my roommates favorite games. She and her boyfriend played it all the time in the apartment we lived in in college. I love logic games so it was fun to watch them play and fun to play myself. It’s still a great game. I was recently sent one of these games to review but since I already know all about it I’m going to donate it without opening. it. Thanks to Pressman, I am able to make this donation and offer one to giveaway to one of you. You set up your code and your opponent must guess you code in a certain amount of turns. The code is made up of four pegs. You choose your code based on six different colors in the order and pattern of your choice. The codebreaker has 10 chances to duplicate your code based on clues you provide. You provide clues or feedback rather on the responses that the codebreaker made as guesses. Did he get two colors right? One color right? There are more than 2,000 possible code combinations and every game can be a challenge. Which is why I love it so. When I was in college I remember my favorite professor used to complain about how they no longer teach logic in school. I was taught logic in school, but I went to a private school. Do they really not teach logic anymore? That’s insane. So if it’s true then get your children some games that will encourage logic. I find it a very important skill. Enter to Win one for yourself. Tweet about the giveaway and include a link to the giveaway. The contest will run until January 25th 11:59 pm Pacific. The winner will be selected by www.random.org. All rules can be found under giveaway rules. I am already a subscriber. Commented on Wordless Wednesday post. WooHoo! Tri-ominos! My sister & I used to play this when we were kids. Thanks for the great giveaway! I like the Giant Pick Up Sticks or the Giant Chess. Deluxe Wheel of Fortune – who doesn’t love that game? Flying Frogs look like that would be a fun kids game. I like the Scooby Do Make A Match Game & the Disney Wheel of Fortune. They sounds fun. I commented on your Cooking With Kids – Bread Machine Pizza post. I would love to try the double twelve dominoes because I love getting my chicken foot and mexican train game on! I know my little ones would like the Giant Tennis and the adults would like the Dominoes:) Please enter me. Thanks!! 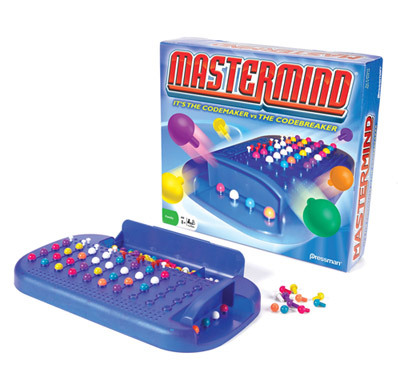 I loved playing Mastermind as a kid! Didn’t know they still made it. This would be fun for all of us! Rummikub is one of those games I always saw growing up, but never have played – would love to try that one of those days. The Seinfeld Trivia Game looks like fun! I’d like to try Deluxe Edition Rummikub. Dont Your Forget IT! dice game is what I would like to play… maybe will help wiht my memory!!! The 6 IN 1 TRAVEL MAGNETIC GAMES would be great too. I commented on your ‘we made cookies for Santa’ post! I want to try Disney Wheel of Fortune! Tournament Dominoes looks like fun. We’d also love to try Rummikub! I remember a game like this that my family played when I was about 10. I loved it! I would also love the cage bingo! I think the Seinfeld Trivia Game would be a hit at my house. I would love to play the pick up stix game. I would like the Flyin’ Frogs and Jumpin’ Monkeys. We would love the Disney Wheel of Fortune game! Commented on Collectible Coke Medallion post! I am a teacher so games are a great learning toy for the classroom, or playground…..of those listed, the giant tic-tac-toe, giant tennis, giant playing cards, giant chess, giant dominoes, giant 4 in a row, any/all of the puzzles that can be used at an early age and also all the was through high school for use as puzzle pieces in design projects, Pass the Bomb, Roll Domo Roll, Domo Caption This! Game, Black Heritage Series games, Travel Series games, Kids games, and Family games. Jepodary! I love that game! i love mastermind! i forgot all about it…im off to find it. Seinfeld trivia all the way! I love board games. They are my families favorite thing to do together. Mancala is one of my favorite games!!!! We like Hello Kitty around here so I’d like the HK Crazy Eight’s card game or the HK Flip’n’Match game. Great giveaway, thanks. Animal Instincts looks good. The whole family could enjoy that. i loved this game as a kid! i would also try blockhead. I would love to have Wheel of Fortune! I like the sudoku board game. Oh how fun is this! I’d like to have the Seinfeld trivia game for the next adult party I have. We just love Seinfeld and still watch it all the time!! I’d love to play the Seinfeld Trivia Game. Thanks for the giveaway! I love all of the giant games, like giant chess or giant playing cards. How fun! I would like to try the hangman game b/c my youngest loves that game right now. We play it the old fashioned way with paper and pencil but she would get a kick of this one. I’m following on Twitter as hybroanglid. Pick Up Sticks is always fun! I love games! I’d love to win this for my kids! It was a favorite with my sister and I way back when! I went to the pressman site and saw so many old favorites! It’s time to teach someone chess in my house and I see they still have a great chess set for kids. And that spelling bee bingo looks great, too! Thanks for offering a great giveaway! I just followed your blog! I like the Giant Chess. I’d love to play the Mr. Bump Make A Match game with my daughter and the Rummikub Large Number Edition with my hubby. I would like to try the Animal Instincts game. i’d love to try cage bingo! The Best of Charades for Kids looks fun! We love games in our house, but never remember to play charades. Thanks for the giveaway! I subscribe to your blog by email. Thanks! I loved Rummikub when I was a kid and I love to have a game of our own in our house. Hmmm…maybe I should write that down as an idea for a Christmas gift for next year! I would really like to try the Giant Tic Tac Toe! It looks awesome. My daughter would get a kick out of that. Thanks for this giveaway. I am subscribed by email. Thank you. I commented on Wordless Wednesday. Thank you. i’d like to try tournament dominoes and disney wheel of fortune! I would like to try the Deluxe Edition Rummikub and the Sudoku Board Game. I’d love to get the double twelve dominoes. I LOVE this game. I would probably get a puzzle or Rummikub, another one of my favorites. I would like to get the Michigan Rummy game I haven’t played that for years! My students would love Smath. I like the Triominoes and Giant Pick-Up-Sticks. Thanks for this offer. I would love to try the Wheel of Fortune game! I follow you on Twitter as eveningstarr1. I’d like to play the Jeopardy or ESPN Jeopardy with my family. I would love to play Dominoes – it’s been such a long time since I’ve payed and it brings back great memories. I would like to try the Oversized Cards, we’re big on card games here. I would like to try Frog Tennis. Frog Tennis looks very fun!